For-profit companies now routinely provide to school districts food, transportation, janitorial, and other services-and even full-scale districtwide school management services. But sometimes the trend works in reverse, such as when private schools convert to tax-funded public school academies, or charter schools. According to the Michigan Association of Public School Academies, nearly 13 percent of Michigan's 186 charter schools converted from existing schools, some of which were formerly private. One such school is Woodland Park Academy, a K-8 school in Grand Blanc that specializes in science activities and fine arts programs. Woodland Park began as a privately funded school, but switched to operating as a public school academy in 1996 when it asked for and received a charter from Central Michigan University. The process for converting an existing school into a charter school can be quite complicated. At Woodland Park, adapting administrative procedures to conform to state regulations has been one of the biggest challenges. Confusion surrounding the administration of state-mandated Michigan Educational Assessment Program (MEAP) tests resulted in the school's 1999 scores being invalidated when student cheating was alleged. This uncertainty in a new and unfamiliar situation unfortunately led to problems and negative publicity for Woodland Academy. Despite such setbacks Woodland Park Academy says it strives to maintain academic excellence and correct problems. Recent MEAP scores show fewer Woodland students placing in the "low" category than in the past. Changes in enrollment and student composition also often occur in the transition to a charter school. Woodland's student enrollment nearly tripled in its first few years as a charter school. The student population expanded to include more diversity in terms of race, socioeconomic status, and educational background. As a private school for gifted children, Woodland was able to select and screen students; however, as a charter school, admission is now determined by a lottery. Woodland's student population also includes students with special education needs. Under Michigan law, charter schools must provide special education opportunities to students needing them. So Woodland Park hired a part-time special education teacher and a consultant to work with the students. A full-time speech therapist was also added to the staff. Discipline is another issue. Problems were less prevalent when the academy was private because of strong parental involvement and smaller classes, says one Woodland teacher who asked to remain anonymous. "It only takes a few to ruin it," she said. "I have to spend 60 percent of my time in discipline with only 40 percent left for class instruction." Now Woodland Park teachers face more challenges as students come from a wider range of family backgrounds. According to the teacher, students are sometimes less prepared due to lack of early education at home. She also noted some parents are "too involved" while others neglect to send their children with even a lunch. A possible explanation for this is that parents may place their children in a charter school as a last effort at behavior correction in school. Woodland attempts to establish an orderly environment partly through a uniform dress code, a system the other local public schools have not implemented. Existing schools that convert into charter schools are not always private. 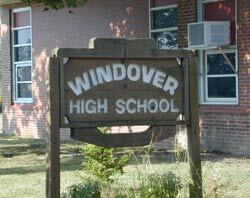 Windover High School in Midland is an alternative education school that admits at-risk students who have dropped out of traditional public school. It offers a core academic curriculum along with skilled trade and enterprise training in areas such as graphic design and technology. Originally a public adult education institute funded by an education consortium, the school was chartered in 1996 by the county intermediate school district after budget cuts left it with little operating funding. Windover also faced many of the same difficulties that Woodland Park experienced upon its conversion to charter status. Enrollment at Windover immediately increased-from 20 to approximately 100 students. "The challenge was to learn what we had to do and do it," says former Windover school board member Linda Starks. Windover teachers and administrators also needed to be brought up to speed on state regulations and laws. The school initially contracted with an outside educational services provider to handle administrative and financial duties and to train school officials in such tasks, according to John Botz, another former Windover board member. While critics complain that charter schools take away enrollment and funding from traditional district schools, both schools can benefit from the presence of charters. When choices are available, if one school does not offer the desired services, parents can send their children elsewhere. For example, Woodland Park offered all-day kindergarten and also fine arts programs such as choir and band for elementary schools. The local community school district noticed the demand for these programs at the charter school and added them to their school's offerings. Windover High School provided an additional educational opportunity for 80 more children than before. The school is also establishing relationships with local businesses so that students can secure employment after graduation. Overall, parents and the public have been receptive to the converted charter schools. Ken Mayo, a Woodland Park elementary science teacher, views the conversion to a charter school as simply "give[ing] parents more choice." Windover's Botz echoed similar sentiments when he said that charter status "allowed us to be more flexible to meet individualized needs."